Faran Sugar Mills Limited will thrive as a proactive partner in prosperity of the nation,recognized as a center for state-of-the-art industrial facilities. Above all, Faran Sugar Mills will strive to be a model business entity where all primary stakeholders are intricately woven in progressive pattern, imperative for the economic growth of the nation. Faran Sugar Mills Limited strives to fulfill its commitments to the society. Our strategic business vision, sound business principles are aimed at quality production with maximum operating efficiency that eventually contribute towards national economy and social well-being of all the stakeholders. Pride in our heritage and a strong sense of community is reinforced by proactive planning and enhanced by effective management. Our unique corporate strategy gets aligned with the resource allocation system and flows down to the operational levels, thus ensuring its implementation at all levels along with the achievement of the intended results. To reduce cost and time over runs which results in improved financial result. To maximize profits by investing surplus funds in profitable avenues. To make investment decisions by ranking projects on the basis of best economic indicators Growth and superior return to all stakeholders. Motivate and train our workforce, revitalize our equipment base and attain full autonomy in financial and decision making matters. To enhance the technical and commercial skills through modern HR management practices. Continuously develop technical and managerial skills at all levels and stay abreast of latest technologies and high performing human resources. Improve the quality of our product to make delightful customer & to be perceived as a Reliable and Efficient company. To provide most reliable supplies to the customers through cost effective means. To set up forces with representation from all relevant departments to improve internal business decision making and strategic planning. Availability of updated information to the shareholders and customers. To use most effective business practice and formulation to the shareholders and customers. To use most effective business practice and formulate a framework of synergic organization with the change in culture. FARAN SUGAR MILLS LIMITED (FSML) is an agri-based company, engaged in the business of manufacturing and selling of refined sugar. 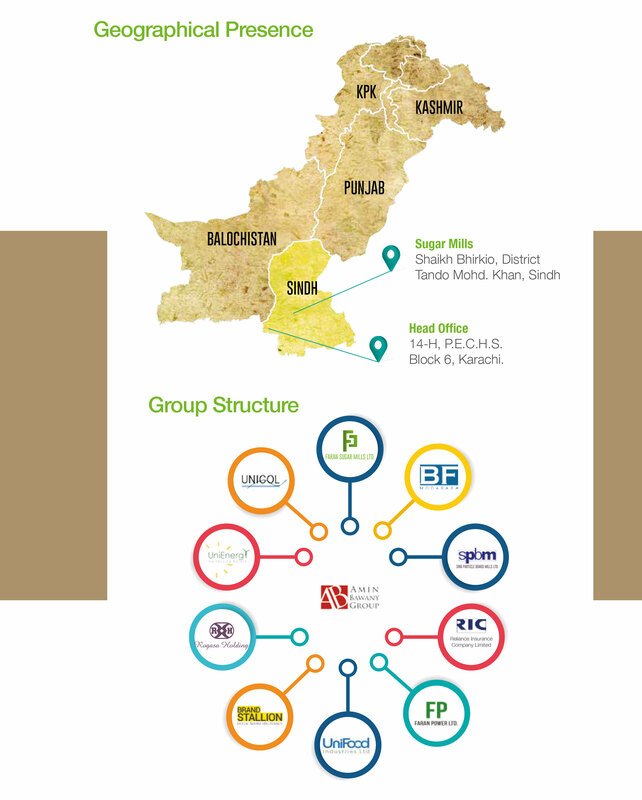 The company is part of Amin Bawany Group which is a leading business group having interest in diversified businesses such as Sugar, Insurance, Modaraba, Particle Board, Ethanol production, Trading, Power, Digital Marketing, Food and other important business sectors of Pakistan. Having a legacy of diversified experience in industrial sector, FSML, commenced its operation in 1981 with an aim to be one of the best sugar mills in the industry. The mill is located at shaikh Bhirkio District Tando M. Khan which is considered as a suitable sugarcane growing area. The plant commenced commercial production in 1983 with installed cane crushing capacity of 2,000 TCD which, after successive capacity enhancements, has now been reached above 10,000 TCD. Al-Hamdulillah, FSML is ranked amongst top sugar mills operating in the province of Sindh in terms of production. The diversified portfolio of our customers includes the manufacture of cereals, confectionary, syrups, drinks, ice creams, biscuits, and so on. Having one of the most efficient sugarcane processing facilities, FSML is a well placed to develop its capabilities in the ahead. We strive to take market leading position through anticipating all the important factors that affect our business verticals. We are committed towards achieving the highest standards of quality and environmental care. The company has made long-term investment in distillery unit namely, Unicol Limited which was formed in accordance with the terms of a Joint Venture agreement amongst the three leading sugar mills of Sindh. It is one of Pakistan largest ENA Ethanol producer and leading food grade CO2 supplier. It’s production capacity is 200,000 liters or 160 M. Tons of Ethanol per day. Presently 100% of its Ethanol is being exported, majority of which is destined for Europe, Middle East, Africa and Far East Markets. It also has invested in purification and liquifcation of CO2 which is a by-product. Its plant has a capacity of 72 M. tons of CO2 per day. Its certification endorse product quality and good manufacturing practices in line with its vision, these certification includes ISO-9001, ISO 14001, ISO-FSSC-22000, OHSAS-18001, GMP. Pakistan has a strong and increasing customer base and has a great potential for expansion in bakery and food industry. As part of a long term diversification strategy FSML has invested in “UniFood Industries Limited” which is engage in food business under Joint Venture arrangement with leading sugar mills. The project is located at Tehsil Hub District, Lasbella, Baluchistan. It commenced commercial production in March 2018 of its signature brand “GOOD GOODIES”, range of Long cakes and Cupcakes with 9 variants. Alhamdulillah, FSML is managing its working capital as well as long-term financing requirements through Shariah compliant financial modes. We are proud to say that FSML is a RIBA / INTEREST FREE CORPORATE ENTITY. We continued our focus on rehabilitation/ modernization of our manufacturing facilities and equipment for long-term sustainability. We take guidance from renowned local and foreign technical consultants of various engineering fields to improve the overall efficiency of the plant with object to create sustainable future growth. We acknowledge that growth does not follow a linear progression. Our primary objective is to deliver higher shareholder returns by leveraging our core capabilities in both local and international markets. We aim to raise corporate value through long-term accountable and sustainable growth and reinvest in our future, venturing ahead of our core competencies, in profitable sectors to supplement earning of our stakeholders and development of the national economy. Energy plays an essential role in our economy and we are mainly focusing energy projects. Pakistan has abundance of energy resources, yet there is acute scarcity of energy supply. Water, sun, wind geothermal energy, and biomass exist in immense quantities than the country can now utilize and, most importantly, they are local and renewable. The company is assessing a number of opportunities including investment in Wind Power and High pressure Cogeneration projects. By the grace of Almighty, these portfolios will not only widen our base, expand our risk and supplement our prosperity, but will also contribute economic growth of our country. Moving to new business era, we promise to set out all our efforts to ensure sustainability and reliability of our investments and to keep focused on pursuance of our growth plans and initiatives while functioning our base / core operations in most reliable and profitable manner. Previously, the sugar mills used to export molasses in raw form. Considering the value addition and optimize the utilization of molasses, Unicol Limited was formed as a public unquoted company which is a joint venture, with shares equally held among Faran Sugar Mills Ltd, Mehran Sugar Mills Ltd and Mirpurkhas Sugar Mills Ltd. All three companies are listed on the various Stock Exchanges of Pakistan. Unicol entered in this industry 8 years ago, started its operations in August 2007, and is optimally producing ethanol from sugarcane molasses every year. The plant is built on 111 acre plot and has the designed capacity of 100,000 liters or 80 metric tons per day, located at Mirpurkhas, Sindh. Maguin Interis, France; exceptionally designed this plant while the biogas plant was intrinsically designed by Proserpol, France. Both the companies are renowned in their respective fields. Last year, the plant capacity was enhanced to 200,000 liters per by Maguin Interis, France and the production began in May 2014. Fermentation of molasses produces Ethanol, which is a by-product of the sugar milling process. Yeast helps in converting sugar in molasses to alcohol. Then separation of alcohol from the fermented wash takes place; and then it is processed and purified through a series of distillation columns to produce ethanol. Currently, 100% of Unicol’s ethanol is exported majorly to European, African and Far Eastern markets. Despite a slump in international prices, the company coped to export Ethanol amounting to Rs. 4.2 Billion, up by 35% against previous year. This accomplishment was due to competent capacity utilization and lower raw material prices. To avoid the environmental hazard caused by the CO2 produced during the process, Unicol has invested in ordering purification and liquification unit of CO2. The CO2 plant is operational since June 2014, designed by Tecno Project Industriale, Italy, having the capacity of 24 metric tons per day. The major customer of CO2 has been the carbonated drink industry but efforts are in process to enter other lucrative sectors. Unicol performs its role in contributing in the social and economic development of our people living in rural areas by providing employment to young talents. The state of the art production facility guarantees the conformity of all health, safety, and environmental laws and procedures. We have productively supplied power to HESCO during the crushing season 2014-2015 as a captive power unit on a take and pay basis using our current infrastructure. We have further invested Rs. 14.2 Million for shifting of exporting power from existing 11 KV Dig Mori feeder originating from 132 KV Grid Station Tando Muhammad Khan to 11 KV independent / dedicated feeder deriving from under constructed 132 KV Shaikh Bhirkio Grid Station District Tando Muhammad Khan on cost deposit basis. Currently, we are considering to set-up 25MW High-pressure bagasse based co-generation power project and have taken all preliminary steps to set up economically viable project. A comprehensive feasibility study for High Pressure Bagasse based Co-generation power project has already been carried out covering all the technical and financial aspects of the proposed project. Request for issuance of LOI (Letter of Intent) has also been submitted to AEDB (Alternative Energy Development Board) under renewable Energy Policy 2006. We are reviewing to mobilize to all available resources, and are also under initial negotiation with potential vendors to install plant on turnkey / EPC basis. The option to adopt up-front tariff has been extended to 28 May, 2017. We have principally agreed to invest up to Rs. 650 Million approximately over the period of 2-3 years in Wind Power Project, which will establish under joint venture arrangement. Shareholders have given the approval in the Extra-ordinary General Meeting held on October 27, 2015. The plant capacity of the project is 50 MW and the project cost is expected to be USD 113 million or Rs. 11.72 Billion approximately. The project’s debt to equity ratio will be 75:25, having an expected equity IRR of 17% over project life. We have appointed Financial Advisor and have inspected the viability of setting-up of a state-of-the-art wind power project in the Province of Sindh. A new Public Unquoted Company “UniEnergy Limited” has been formed for purpose of setting up of wind, solar and other alternate power projects. We have already received Letter of intent (LOI) from Energy department of government of Sindh and initiated dialogue with potential financing institutions, hiring of legal Advisors simultaneously discussing EPC contractors (Engineering, Procurement and Construction Contractors). The demand for energy has amplified in tremendous magnitude in the last few decades in Pakistan; the same is expected to increase further in the coming years. The increase in cost of fossil fuel and the various environmental problems of large scale power generation have lead to high demand of electricity generation from non-conventional sources like wind power and solar power etc. These natural resources of energies are the possible clean and low cost renewable resources available in the country. However, the potential of using the alternative source of natural energy has not been explored properly in Pakistan. The advantage of using wind power is the minimal dependence on imported fossil fuel and at the same time expansion of the power supply capacity to remote locations where grid expansion is not practical. Recently conducted survey of Wind Power Potential along coastal areas of the country by Pakistan Meteorological Department (PMD), indicates that an opportunity exists for harvesting wind energy using currently available technologies, especially along Sindh coast-Jhimpir, Gharo, Keti Bandar and Bin Qasim. District Tando M. Khan Sindh.